(TomDispatch) “No headlines announced it. No TV pundits called it. 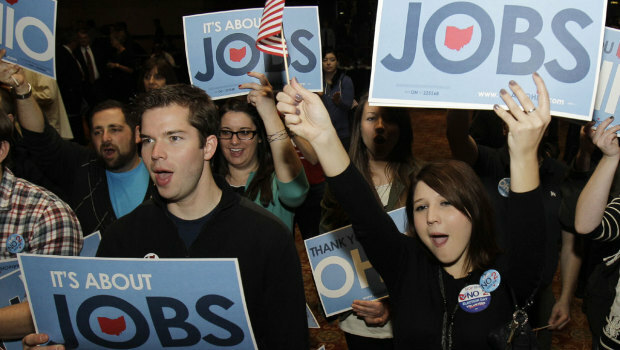 But on the evening of November 8th, Occupy Wall Street, the populist uprising built on economic justice and corruption-free politics that’s spread like a lit match hitting a trail of gasoline, notched its first major political victory, and in the unlikeliest of places: Ohio. Don’t believe me? Then think back to this spring and summer, when Occupy Wall Street was just a glimmer in the imagination of a few activists, artists, and students. In Washington, the conversation, such as it was, concerned debt, deficit, and austerity. The discussion wasn’t about whether to slash spending, only about how much and how soon. The Washington Post‘s Greg Sargent called it the “Beltway Deficit Feedback Loop” — and boy was he right. A National Journal analysis in May found that the number of news articles in major newspapers mentioning “deficit” was climbing, while mentions of “unemployment” had plummeted. In the last week of July, the liberal blog ThinkProgress tallied 7,583 mentions of the word “debt” on MSNBC, CNN, and Fox News alone. “Unemployment”? A measly 427. This all-deficit, all-the-time debate shaped the final debt-ceiling deal, in which House Speaker John Boehner and his “cut-and-grow”-loving GOP allies got just about everything they wanted. So lopsided was the debate in Washington that President Obama himself hailed the deal’s bone-deep cuts to health research, public education, environmental protection, childcare, and infrastructure. These cuts, the president explained, would bring the country to “the lowest level of annual domestic spending since Dwight Eisenhower was president.” After studying the deal, Ethan Pollock of the Economic Policy Institute told me, “There’s no way to square this plan with the president’s ‘Winning the Future’ agenda. That agenda ends.” Yet Obama said this as if it were a good thing. Six weeks after Obama’s speech, protesters heard the call of Adbusters, the Canadian anti-capitalist magazine, and followed the lead of a small crew of activists, writers, and students to “occupy Wall Street.” A few hundred of them set up camp in Zuccotti Park, a small patch of concrete next door to Ground Zero. No one knew how long the occupation would last, or what its impact would be. Bio: Andy Kroll is a staff reporter in the D.C. bureau of Mother Jones magazine and an associate editor at TomDispatch. This piece originally appeared on TomDispatch. The opinions expressed in this commentary are solely those of the author.